Today was a big day. After nearly a year of searching for a radio site, we were finally able to move forward on the Cupertino ARKnet project, which I last blogged about last January. The Cupertino ARKnet is a project that my friend Marcel and I decided to support with the city of Cupertino to build a point to multi-point microwave network across the city to provide resilient network connectivity between the city Emergency Operations Center (EOC) and various critical sites around the city. This network is designed to stay up in the event of a major disaster and still provide a suite of useful services, even if Internet connectivity is entirely cut off. What has proven to be the largest challenge so far has been getting access to a site where we have line of sight for most of our sites of interest. 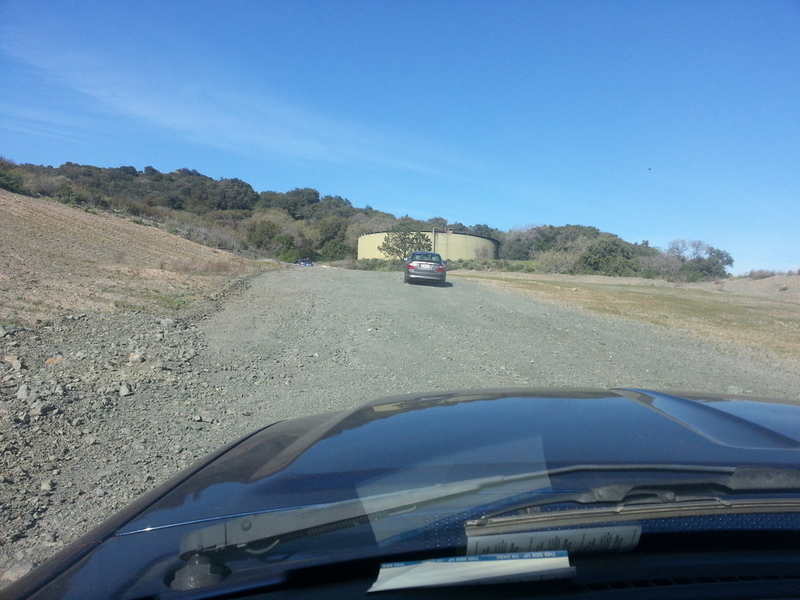 This challenge was finally overcome when we signed a site agreement with Lehigh Southwest Cement to build a sector site on an abandoned water tower on the northern edge of their property, which is on the western edge of Cupertino. The day started off bright and early at 8:30am. We all met up at Marcel's apartment and loaded up all the staged equipment and supplies between Marcel's car and my pickup. This radio site isn't the most difficult site to get to, but there are dirt roads involved, which are normally only used by heavy quarry equipment. 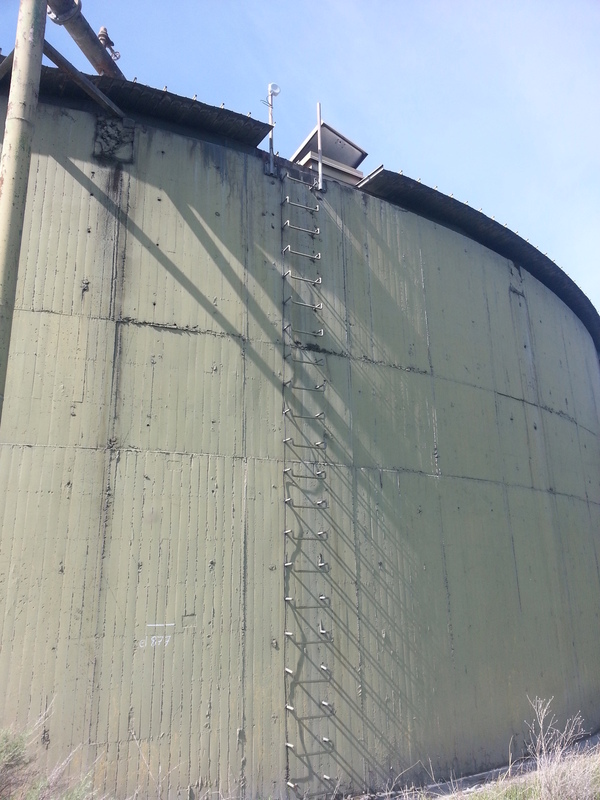 The site is an abandoned water tank on the side of the waste pile for the Permanente Quarry. Lehigh Cement wasn't able to provide us power this far from their plant, so it looks like we need to run the site off-grid. The first order of business for the day was clearing and leveling a location for the solar panels. Lehigh was not able to provide us with power and our site agreement didn't include pouring concrete (the irony was not lost, considering that this is a cement plant), so the site is powered by a free-standing solar panel array on pavers. Marcel did an amazing job designing and building the panel frame out of unistrut. You'll notice that we've got the panels angled unusually high. For angling solar panels, the rule of thumb is that for maximum power generation across the year you want to match your panel angle to your latitude. This is technically correct, but is only true for power generation averaged across the entire year. 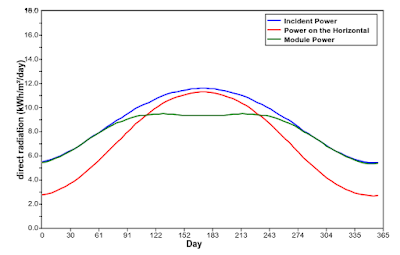 This is fine for grid-tied solar systems since any excess generation during the summer can be dumped onto the grid, and shortfalls in the winter can be covered by buying energy from the local utility company. 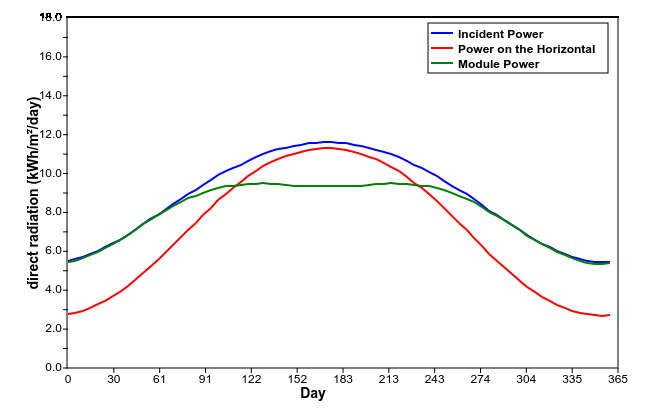 Since our system is off-grid and only has 100Ah of batteries, we're much more concerned with the minimum daily power generation (in the middle of winter) than the total available power across the whole year. During the summer, there's going to be so much power available that our battery bank is going to be fully charged half way through the morning, and then the rest of the power for the day is going to do nothing but keep the batteries topped up. Instead of the 37 degrees elevation based on our latitude, we built the frame to hold the panels at 50 degrees elevation. Now our winter power is as high as possible, at the expense that we're leaving a bunch of power on the table during the summer, which wouldn't be put to any use anyways. Once we got a good start on the solar panel install, I turned to the issue of mounting the access point on the top of the water tank. For our initial roll-out, we're only using a single 10MHz wide channel in the 5.8GHz unlicensed band. As our network grows and we find needs for greater bandwidth, we plan to add additional sector antennas here or at additional sector sites (the network routing has been designed with multiple sites/antennas per sector in mind). As for the hardware up the tower, we're using a Mikrotik SXT SAr2. (Yes, it's really there; it's tiny!) This gives us a relatively wide 90 degree beam width, which for this site covers all of Cupertino with a single radio. All wisdom about deploying point-to-multi-point says that trying to cover this much of this area is going to be a bad time. Frankly, I'm going to be relatively shocked if we make it very far with just this one sector antenna, but getting to the site and adding more radios is so easy that I figured we would give this a wag and see how far it gets us. We're not looking for a huge amount of bandwidth (~5Mbps), so we can tolerate lower levels of quality than if we were trying to operate a consumer WISP. While I was up the tower playing around with hose clamps and zip ties, the rest of the team installed the solar panels and electrical system. The solar panels are four 80W CdTe thin film solar panels (BP Solar 980L). You might say 320W of solar panels for a single 5W router might be a little over-kill, and I wouldn't disagree with you. We are going to have a very comfortable power budget (which is going to keep our batteries really happy), and this leaves us plenty of room for growth as this site gains additional sectors, point-to-point links, etc over time without us needing to revisit the power system. I deeply, deeply regret having gotten frameless thin film solar panels for this project. It's the timeless story: guy finds guy on Craigslist. Guy offers guy solar panels at $0.75/W. Guy gets great deal on solar panels before entirely appreciating what a pain it is sourcing 6mm frameless panel clamps. Getting the edge clamps for these panels to mount them to the unistrut was a huge pain, and I'm never dealing with it again. The electrical cabinet for this site was graciously donated to us by the Cupertino maintenance department (synergistically transferred, really? ), and again is set up for growth. The bottom shelf holds two 100Ah 12V deep cycle lead-acid batteries, wired in series to make a 100Ah 24V bank for the solar charge controller. The middle shelf holds an EPSolar Tracer 2215BN solar charge controller, a 24V-12V DC-DC regulator to provide some 12V power for the network switch and fan, and an unmanaged workgroup switch with a PoE injector for the access point on the tower. The solar controller warrants some particular attention: this is by far the least expensive solar controller I've seen which actually uses Maximum Power Point Tracking (MPPT), which is a big deal. Lots of $20 charge controllers on eBay will claim that they are MPPT, but they simply aren't. MPPT means that the controller is going to make an effort to hold the panel array at the correct voltage/current to extract the maximum amount of power available from it given the current solar conditions, which isn't a trivial task since this magic point moves throughout the day based on the amount of sunlight and temperature, and the fact that the panels are wired as an 80V array while trying to charge a 24V battery bank. This takes a serious DC-DC buck converter, which is why MPPT controllers need such a beefy heat sink compared to the cheaper PWM controllers. The top shelf is currently mostly empty, waiting for more equipment or a second battery bank. The only thing there now is an MT-50 control head for the solar controller. This is another feature of the EPSolar Tracer series controllers that I absolutely love: their user interface is over RS-485 MODBUS, so you can mount your controller as close as possible to your batteriy bank and load, and all you need to do is run CAT-5e to wherever you want your nice user interface to the controller. The control head lets you set the battery charge mode, etc, as well as review all the collected statistics like current panel/battery/load voltage/current and cumulative power generated/consumed in kWh. SHAMELESS PLUG: I'm giving a talk on solar panels and designing these sorts of solar power systems next month in San Jose on April 13th, 2016 at the West Valley Amateur Radio Association. If you're in the Silicon Valley and interested, I encourage you to come see. Last points of order for the day were fit and finish on the cabling and adding weights to the array frame. I will freely admit that it is possible that two T-posts, three cinder blocks, and 20 sandbags are maybe overkill for keeping this panel array from blowing away, but we really don't want it to blow away, and the sandbags were free (thanks city of Cupertino!). In an ideal world, we'd have poured concrete and/or had a much better idea what our worst case weather conditions would be on this hill. Barring both of those, we decided to just make a good wag at "really heavy." As for the question of how well the site is working, that's a question I can't answer yet. The next step in the project now that we have the first access point up is deploying client sites to connect to this one. The first 90% of the work is done, so now we just need to get the next 90% done and see where it takes us. Of course, a huge thanks again to our great team of volunteers, the city of Cupertino for supporting us on this project, and a HUGE thanks to Lehigh Southwest Cement for entertaining some random group of volunteers setting up some equipment on their property. The Cupertino ARKnet wouldn't be possible without everyone's help.